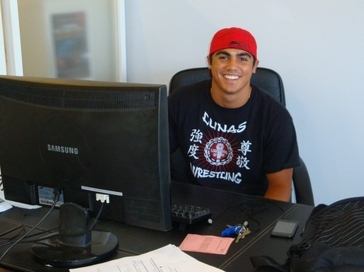 Lake Casco, son of Randy and Stacy Casco of Lahaina, is a 2008 graduate of Lahainaluna High School. Lake is currently attending the Univ. of Pennsylvania, majoring in Materials Science and Engineering, with a minor in Energy and Sustainability. He is set to graduate in spring of 2012. In his free time, he enjoys going to the beach, surfing, playing guitar, and working out. Upon graduating from Penn, Lake is interested in pursuing a job in renewable energy or sustainability. Borosilicate glasses, because of their superior thermal properties, are used in numerous applications. One of the most common is their utilization as the substrate for mirrors in many telescopes. To assess the possibility of molding large chucks of borosilicate for mirrors in-house at HNu Photonics, the reconstruction of an old kiln was commissioned. Borosilicate glass has a working point of approx. 2300 ?F, but the temperature specifications of this particular kiln were unknown. The broken firebrick interior was repaired using refractory mortar, and a new programmable temperature controller and thermocouple were installed on the kiln. Since detailed information on borosilicate heat treatments is not widely available due to its proprietary nature, a rough treatment based on available information was devised and performed. First, borosilicate frit was created in-house using scrap borosilicate and a variety of methods. This frit was placed into a simple graphite mold, and the temperature was slowly ramped up to the glass’s working point, then held constant until all air bubbles had escaped. Next, the glass was very slowly cooled to its annealing temperature, 1050 ?F, and soaked at that temperature for a few hours to allow any stresses developed from cooling to dissipate. Finally, the glass was cooled very slowly to its strain point at 800 ?F, after which the cooling rate was increased until the kiln returned to room temperature. Based the on the quality of the glass in the first run, different cooling rates and more complex molds will be attempted.